The chops are prepared from Item No. 411. 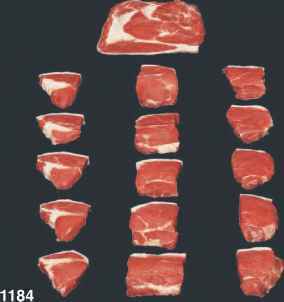 The chops are prepared from Item Nos. 412 or 412C. 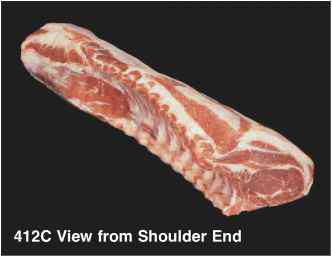 PSO 5 - Purchaser may request only the Porterhouse Chops from the pork loin. The pork tenderloin shall be plainly evident on both sides of the Porterhouse Chop. 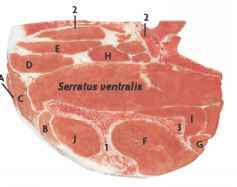 Graphic illustration of the length of tail difference on Pork Loin Chops. 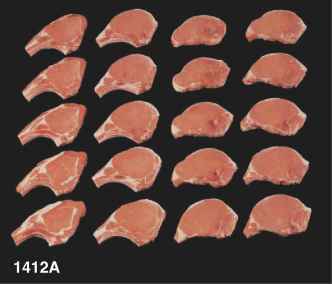 Mil A Pork Loin Chops, Center-Cut, 141ZM Chine Bone Off The chops are prepared from Item Nos. 412A or 412D.